For most living rooms, the TV is the center of attention. Flat screen TVs don't take up a lot of room. On the flip side, all the gadgets that go with it like your Apple TV, cable box, or gaming system (and all the cords that go with them) are super unsightly. 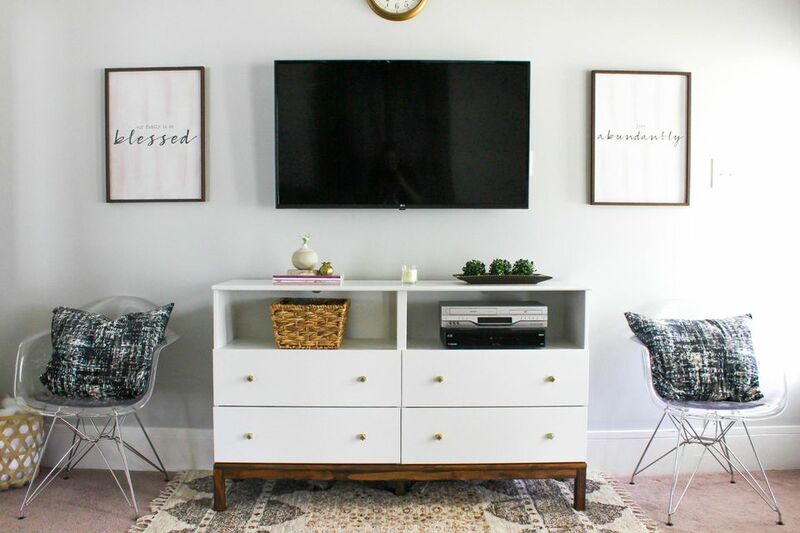 These six DIY TV stands will conceal the hideous accessories in a stylish piece of furniture. If you are looking for a cheap TV stand, you can pick up an IKEA Lack unit for around $50 or less. Unfortunately, the unit's open design will not conceal your devices and cords. When it comes to style, the unit is a bit of a yawn. That is why this IKEA hack from the Dutch décor site, Song Bird Blog is so innovative. The inexpensive project uses planks, paint, and an electric stapler to transforms a 10-year-old Lack TV stand into a living room showpiece. The new hatch doors on the front keep devices and cords out of sight. The wooden wine crate on the center shelf is a home for remote controls. For other budget-friendly ideas, check out the 21 best IKEA IVAR storage hacks. So you hung your new TV on the wall and now you have no place to put your Roku Premiere or other accessories. What do you do? Steal this ingenious idea by Country Design Style. While the wall-mounted unit looks like a shelf, it is actually a secret cabinet that conceals several set boxes. You can also get inspired by these 7 smart storage solutions to steal from tiny homes. Storage solutions that keep floors clear include this modern floating console created by the small space dwellers behind Petite Modern Life. They hacked several IKEA kitchen cabinets to create this unique TV storage system. The frosting on the cake is the pine panels used to decorate the top and sides of the console. The back of the cabinets hide the cords that plug into the flat-screen. If you have a smaller house, check out the 21 best IKEA storage hacks for small bedrooms. It takes vision to turn something old into a new item with a spanking fresh purpose. This​ DIY created by the smart blogger behind Adventures in Creating reinvents a bunch of old army green deposit boxes. First, the boxes were reassembled and then painted white. Afterward, they were mounted on hairpin legs. One box drawer was removed to create a shelf for the cable box and DVD player. The other drawers provide storage for various items including the family photo album. This rustic DIY TV stand by the folks at Liz Marie Blog is so easy to build they claim virtually anyone can make it. It uses pretty décor like baskets and knickknacks to hide and draw attention away from eyesores like wires and set-top boxes. Sometimes the most straightforward solutions are among the smartest. If your living room is piled with stuff from your house, aim to declutter your home for a happier living space. For less than $100, Pinterest user Kaitlin Rabitoy created a farmhouse inspired TV stand with hidden storage using wooden crates. You can purchase unfinished wood crates at most discount stores. Sturdy options that would be appropriate for this project cost up to $10 each. Before assembling her new TV stand, she stained and sealed each wooden crate. Afterward, she carefully arranged them. To make cords and set boxes seemingly disappear she put them in different crates before turning them sideways.